Calipet lives in Fontvieille, right by the small port of Monaco. 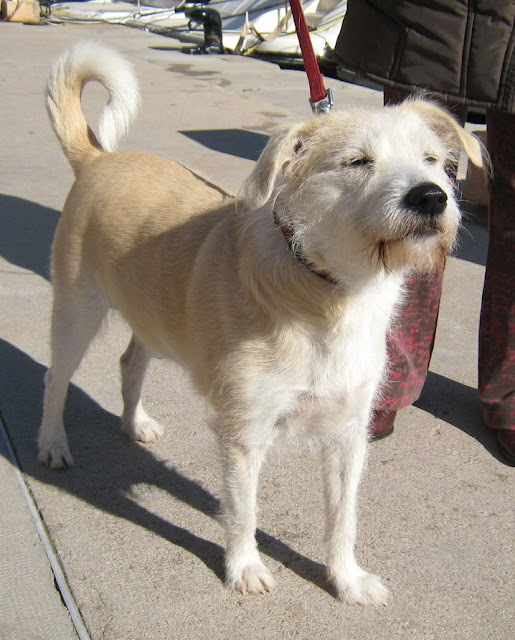 She's a mix of Fox Terrier and Golden Retriever or Labrador and is two and half years old. Her owner was SO nice. She saw me photographing sculptures for Monte Carlo Daily Photo and asked if I'd seen a specific new and modern sculpture in Fontvieille. I hadn't. So she insisted I went and saw it and indeed took me there. As we walked along she told she was born in Monte Carlo and as a child used to fish off the port - she'll have seen many changes over the years. Calipet met several dogs as we walked along - she knows these streets - a lovely dog and great rapport between her and her nice owner. She is indeed a lovely dog. What a lovely lady and her dog Jilly! Very nice of her to do that. I love friendly people, don't you? And her dog is such a beauty!